The film has been written and developed through collective discussion and improvisation; and as such, we will sign the work under the name of the group we formed in Haiti 2017: The Living and The Dead Ensemble. The Living and the Dead Ensemble was created in Port-au-Prince in November 2017. As a collective of 11 artists from Haiti, France and the UK, they first gathered for the Monsieur Toussaint Sessions workshop at the Centre d’art in Port-au-Prince July 2017, working together on translating the play 'Monsieur Toussaint' by Édouard Glissant from French to Haitian Kreyol. Focusing on theatre, cinema, poetry, song, slam and rap, the collective performed the Kreyol version of 'Monsieur Toussaint' in the cemetery of Port-au-Prince as part of the Ghetto Biennale 2017. The Living and the Dead Ensemble is Atchasou, Léonard Jean Baptiste, Mackenson Bijou, Rossi Jacques Casimir, Dieuvela Cherestal, James Desiris, James Fleurissaint, Louis Henderson, Cynthia Maignan, Olivier Marboeuf and Zakh Turin. The narration takes place between two locations: France and Haiti—where a ghost story unfolds about the history of the Haitian revolution. In 1791, the slaves and the freed people of colour in the colony of Saint-Domingue rose up against the French. In the process they abolished slavery on the island and established the first free black state in the Americas with the Haitian constitution of 1804. Somewhat obscured and ignored throughout history, considered minor to the revolutions of the USA and France, the Haitian Revolution was perhaps the only revolution of the 18th and 19th centuries to truly live up to the Enlightenment ideals of the universal human rights of freedom and equality. The Revolution was initially led by a former slave who became an army general: François-Dominique Toussaint Louverture (20 May 1743 - 7 April 1803), also known as Toussaint L’Ouverture. He was arrested by Napoleon Bonaparte’s army in 1802 and brought to France, imprisoned in a medieval castle in the Jura Mountains where he died from pneumonia and malnutrition in April 1803. Ouvertures takes the viewer on a journey from the National Archives in France, to the frozen stratigraphic landscapes of the French Jura and into the heart of a baroque-like limestone cave, through rivers and waterfalls into the sea that connects these two worlds, eventually arriving in Haiti, where we come across a group of young actors rehearsing scenes from a Creole translation of the play Monsieur Toussaint by Édouard Glissant. The film is in three parts. 1. Bring breath to the death of rocks. 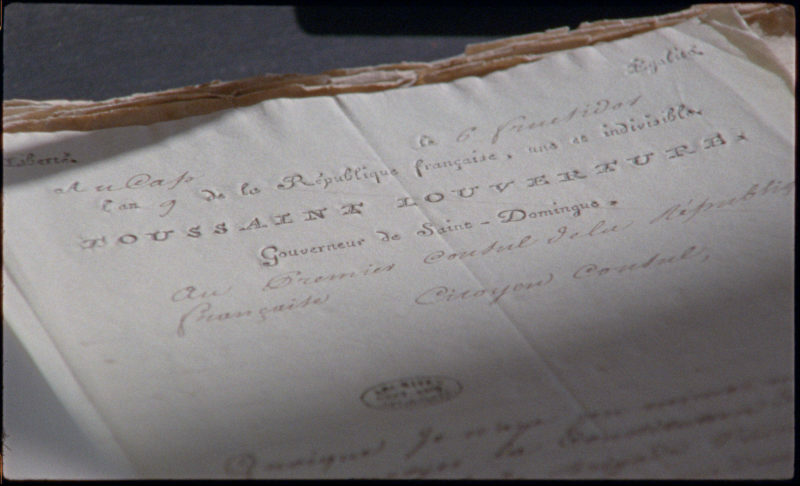 Travelling from the documents in the French National Archives to the prison cell in the Jura Mountains in which the manuscript was written, this introductory film suggests an archaeology of the colonial history of France buried within its landscapes and institutions. Many millions of years ago the Jura was a tropical ocean, as it metamorphosed into the mountain range it is today it left behind large sedimented layers of time, forming the strata that fold along the horizon line today. 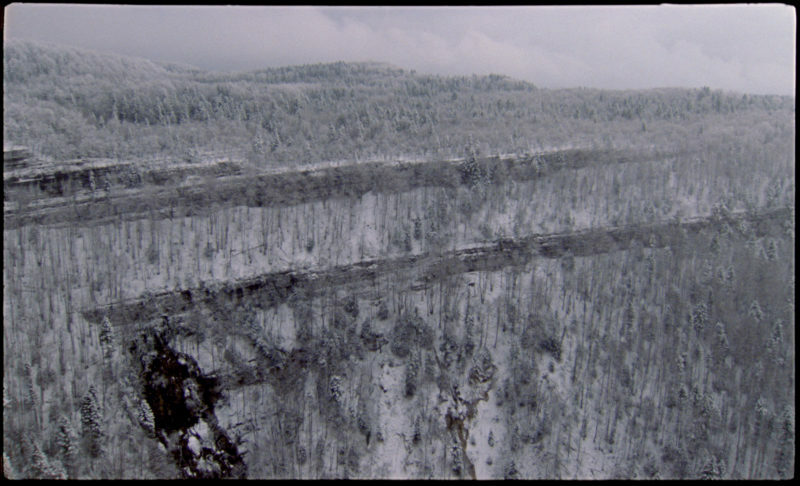 If strati-graphy means the writing of strata, this films suggests a reading of strata in which the fossilised history of Louverture can be brought to life through a form of geologic haunting. 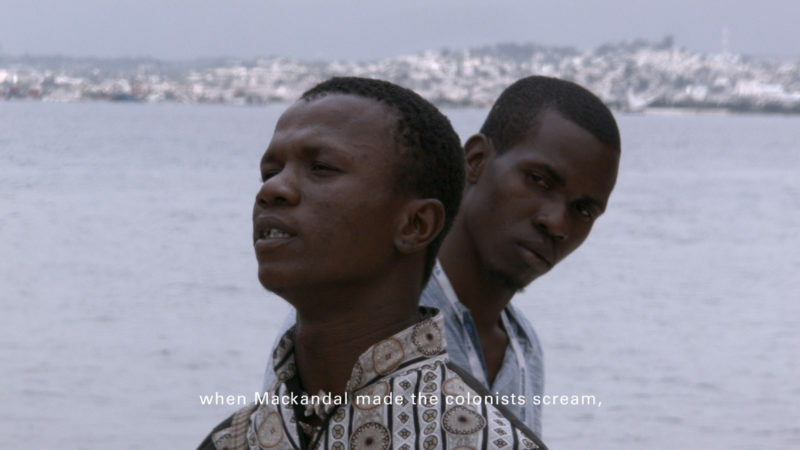 Narrated with fragments of Louverture’s letters, Notebook of a Return to the Native Land by Aimé Césaire and a passage from the opera Orfeo by Claudio Monteverdi, the film turns to baroque, epic and tragic aesthetic forms as a way to speak of the escape and eventual journey of Louverture’s ghost through water, rock and human bodies. 2. These lowest depths these deeps. Placed as a transition between France and Haiti this short section imagines the journey made by the ghost from the waterfalls and rivers of France, into the Atlantic Ocean and across-away towards the Caribbean Sea. It also moves between the material supports of celluloid film and digital video creating an in-between and hybrid form in a process of becoming, suggesting a transformation between different states of being for the ghost. The sea is understood as the medium for the transmission of history, language and culture and as the dividing line between the world of the dead and the world of the living. 3. We stand our mouths open under the sun. Moving between culturally and historically important post-revolutionary landscapes in Haiti and scenes of a group of young actors rehearsing a play in Haiti’s capital of Port-au-Prince, this section focuses on the relation between errancy, collectivity and what Kodwo Eshun has termed ciné-marronage (a form of cinema that flees an oppressive centre into a peripheral sphere). The film walks with an unnamed character, who transports the ghost of Louverture through Haiti’s countryside towards the city where he comes across rehearsals of a creolised translation of Monsieur Toussaint. 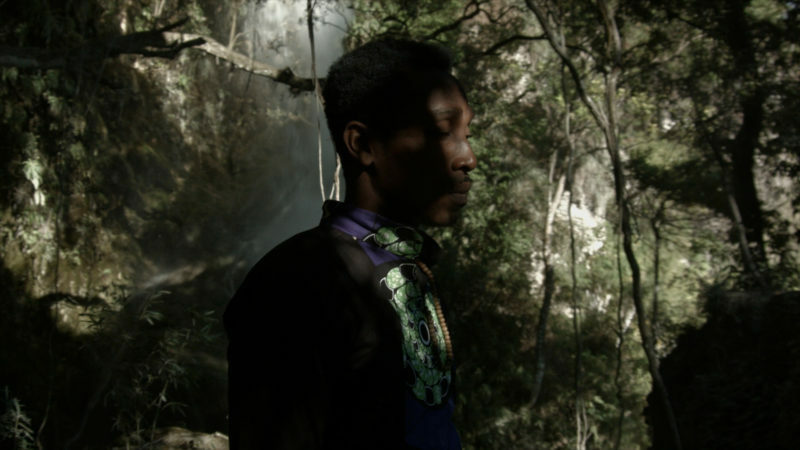 The character has returned to his home country after years away and slowly falls into place within contemporary Haitian society, becoming part of a collective consciousness. 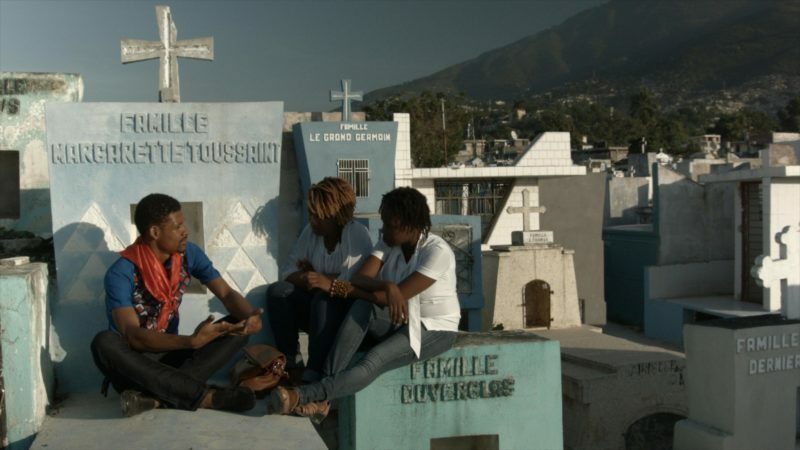 Haiti’s past and future are discussed through entirely improvised scenes and through the words of Glissant’s play which are transformed through the bodies of Haiti’s youth. The ghosts of the past are brought to life in the bodies of the present as a way to form a collective resistance for future struggles. LOUIS HENDERSON is a filmmaker who is currently trying to find new ways of working with people to address and question our current global condition defined by racial capitalism and ever-present histories of the European colonial project. The working method is archaeological. Henderson has shown his work at places such as; Rotterdam International Film Festival, Doc Lisboa, CPH:DOX, New York Film Festival, The Contour Biennial, The Kiev Biennial, The Centre Pompidou, SAVVY Contemporary, The Gene Siskell Film Centre, Gasworks and Tate Britain. His work is in the public collection of the Centre National des Arts Plastiques, France and is distributed by Lux (UK) and Video Data Bank (USA). Info: Ouvertures is supported by HOME, Manchester, Arts Council England, Le Centre national des arts plastiques (France), and Le Centre national du cinéma et de l'image animée (France).